For once, Donald Trump didn't have the most quotable moment of a debate. During the second GOP forum on Sept. 16, Jeb Bush admitted to smoking marijuana, so light up a toke and call me Sally, it was one of the most chill moments in an otherwise heated debate about abortion, immigration, and gun laws. But right now, there might be no one more heated than Barbara Bush. 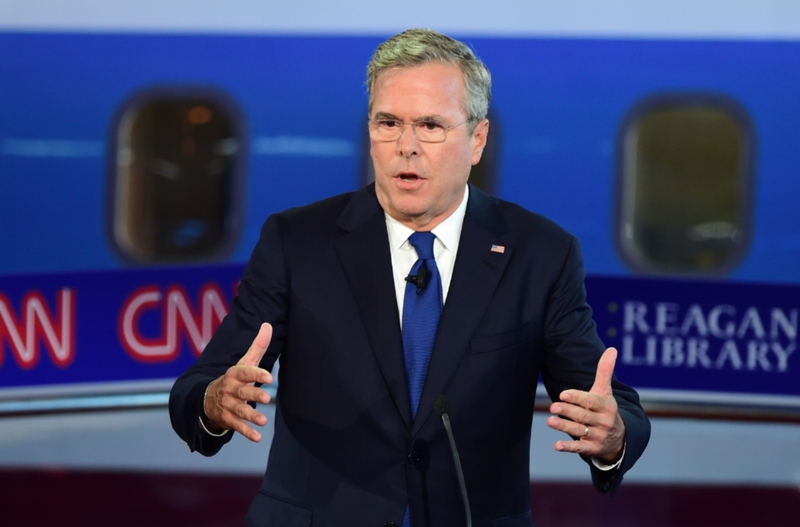 Jeb is concerned that that time he got high 40 years ago might make Mom mad, but hey — Jeb. As one younger sibling to another, Mom doesn't care what you do when your older brother is kiiiiind of a big old mess. You're cool, buddy. Plus, it's not Mom who Jeb needs to be worried about. It's the American people who hate weed so much. Who can't stand the natural stuff. Who really want to criminalize the plant and put as many people in jail as possible, because jailing people is what we do. Oh, wait. Nah. Citizens of this fair nation are not opposed to the decriminalization of marijuana. In fact, a majority of Americans support the legalization of weed. A recent poll showed that 53 percent of us think it'd be totally cool, man, to stop cuffing people for lighting up a joint every now and again. So, Jeb. While Mom might not like that you smoked the ganja, voters might be OK with this. No need to apologize!